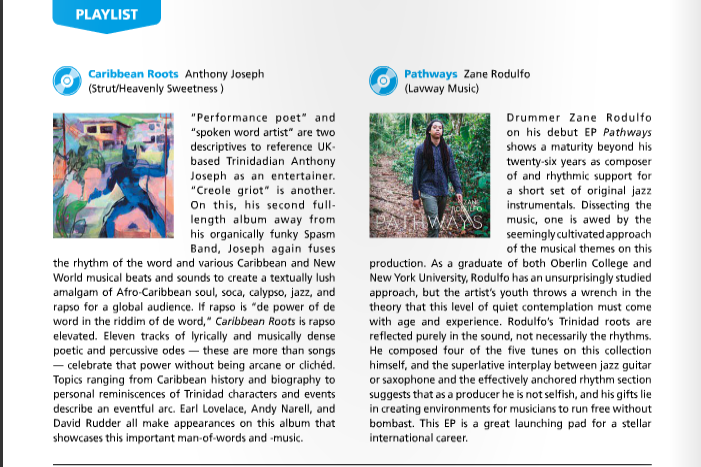 Zane Rodulfo featured in May/June issue of Caribbean Beat! “Performance poet” and “spoken word artist” are two descriptives to reference UK-based Trinidadian Anthony Joseph as an entertainer. “Creole griot” is another. On this, his second full-length album away from his organically funky Spasm Band, Joseph again fuses the rhythm of the word and various Caribbean and New World musical beats and sounds to create a textually lush amalgam of Afro-Caribbean soul, soca, calypso, jazz, and rapso for a global audience. If rapso is “de power of de word in the riddim of de word,” Caribbean Roots is rapso elevated. Eleven tracks of lyrically and musically dense poetic and percussive odes — these are more than songs — celebrate that power without being arcane or clichéd. Topics ranging from Caribbean history and biography to personal reminiscences of Trinidad characters and events describe an eventful arc. Earl Lovelace, Andy Narell, and David Rudder all make appearances on this album that showcases this important man-of-words and -music. Drummer Zane Rodulfo on his debut EP Pathways shows a maturity beyond his twenty-six years as composer of and rhythmic support for a short set of original jazz instrumentals. Dissecting the music, one is awed by the seemingly cultivated approach of the musical themes on this production. As a graduate of both Oberlin College and New York University, Rodulfo has an unsurprisingly studied approach, but the artist’s youth throws a wrench in the theory that this level of quiet contemplation must come with age and experience. Rodulfo’s Trinidad roots are reflected purely in the sound, not necessarily the rhythms. He composed four of the five tunes on this collection himself, and the superlative interplay between jazz guitar or saxophone and the effectively anchored rhythm section suggests that as a producer he is not selfish, and his gifts lie in creating environments for musicians to run free without bombast. This EP is a great launching pad for a stellar international career. This collection of recent soca tunes and party anthems from Trinidad Carnival — both the 2016 Road March and Soca Monarch winning songs are here — continues the trend by mega-producer Kasey Phillips and his Precision Productions label of compiling the best of “we muzik” for an international audience who did not have the joy of being present at the annual biggest party on the planet. Since Phillips is also the producer, co-producer, or remixer of all the tracks on the album, compiling “the best” of Trinidad Carnival music also underscores his significance as a producer of modern soca music. A few riddims can go a long way: six songs share the Shake Down Riddim without getting boring. Stars Machel Montano and Destra Garcia and newcomers like Voice all revel in Phillips’s winning production magic. It is said that one man cannot make an industry, but this compilation album comes close to disproving that theory. Calypso has a recorded history of a little over a century. In 2016, it is a rarity for a full album of calypso as opposed to soca to be produced. Kurt Allen, the self-described last “bardjohn” of calypso, mockingly notes the role and role-play of the calypsonian as singer and calypsonian as lyrical danger-man, threatening sense and sensibility. Doing the unthinkable with this collection yet adding sense to reality, he offers a “pay-what-you-want” pricing strategy cementing his vanguard role as preserver of the artform for a new audience motivated never to forget traditions. Calypso researcher Donald R. Hill describes calypso lyrics as “a bible of Creole thought,” and on this album, it is the lyric that makes the case for the notion of Allen as griot in the tradition of messenger and sage. “Allyuh ever ask yourself what is calypso?” is the opening line of the title song. Over the ten tracks, we discover the answer. NB: this text is copyrighted, and only limited excerpting with full attribution is permitted. For licensing and reproduction permissions, please contact us directly.